Learning Target: I can explain rapid changes to the Earth’s surface, such as volcanic eruptions, earthquakes, and land slides. 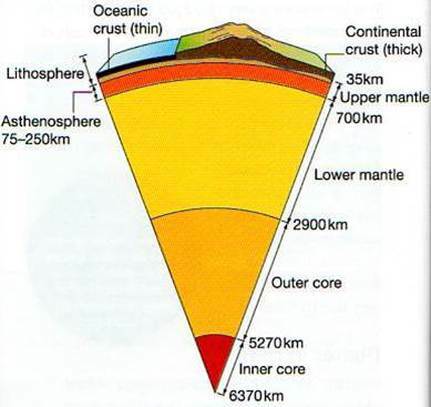 What are the layers of the Earth and what is each one of them like? Distribute copies of Round-Table Questions (one set per table). Students pass the pages around the table, each writing their answer on the page. When all are done, share the information for each level by rolling the mouse over its name. English: What Processes Change the Earth’s Surface? Students take notes in T-chart classifying events as causing changes slowly or rapidly to the Earth’s survace. Discuss three types of plate boundaries. Hands-on Activity: Use spaghetti to model pressure between plates. Discuss this vocabulary: plate, boundary, pressure, fault. Students glue Tectonic Plates Map in their notebooks.